As a Google Ads Expert, one question I’m always asked by clients is what they should be spending in their campaigns. Of course most advertisers prefer to start with as little as possible. And that’s understandable especially at the beginning when you’re unlikely to know how your ads will perform. So I’ve included here some tips to help you decide on how much to spend each month in Google Ads. A test budget can be as low as possible to test your ads. However, it shouldn’t be too low such that it takes you a long time to assess the performance. One factor to consider when setting a test budget, is what average cost per click you are aiming for. For example, if the average CPC is £1.30 for your keywords, then a monthly budget of £600 will bring in about 462 clicks. On average, you should aim to drive 100 clicks per ad group to determine the performance. Of course that is only helpful if you have created tightly themed ad groups with targeted ads and keywords. So with our example above of 462 clicks, you will have some ad groups that will have reached the 100 minimum clicks. And from this you can assess the conversion rate. If the industry average conversion rate is 3% and you’ve managed to achieve this, then you will have achieved about 3 sales – for each ad group that has reached this minimum. 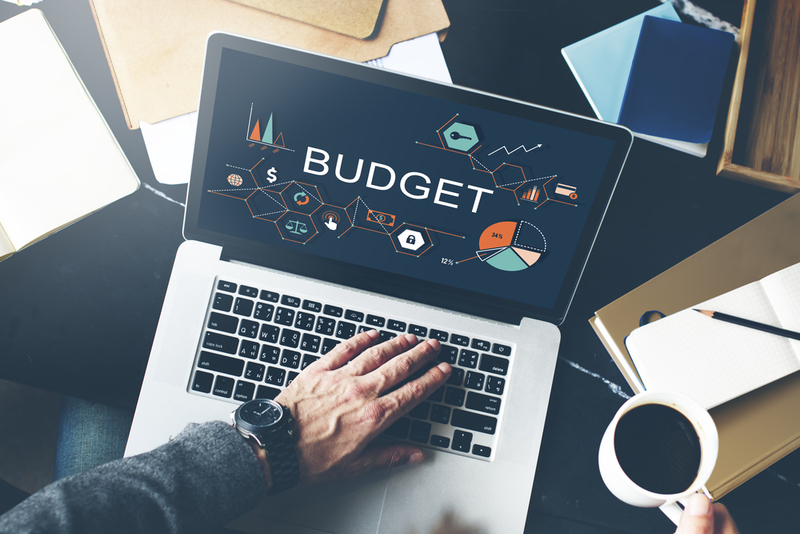 You can then adjust your budget according to performance results you want to reach and continue to optimise your campaigns. What are your goals for leads or sales? Say your target is to get 200 leads each month through Google Ads, you’ll need to work out what that will cost you. First, you need to work out your target cost per acquisition (CPA) and the average conversion rate. If you’ve been running some campaigns this will be easier to find. However, if you’re just starting out, then you should look at running some test campaigns. And before you launch your ads, make sure you have setup conversion tracking. With this data you can then change to a Target CPA bid strategy. Your account will suggest a CPA to set based on its knowledge of the performance of your campaigns in the past. And it will then bid automatically and choose the right positions to help reach your target. You can then adjust your bid in the tool to see what average positions and average CPC you will get. These of course are estimates, but they help to choose the budget that will help you reach your goals. What is the suggested bid? The Keyword Planner tool will also provide a suggested bid for many of your keywords. And it will show you the level of competition for each: Low, Medium or High. This is helpful if you will be using the Manual CPC bid strategy. That’s because when you first launch your campaign you’re unlikely to know what bids to set to achieve the best position and click results. It also helps with an automated bid strategy like Maximise Clicks because you can put a bid limit to prevent the system from bidding higher. The suggested bids will then help you decide how much to set because you will know how competitive your keywords are. One of the best tools to help you see how much your competitors are spending is Spyfu.com. And another is SE Ranking which I’ve found very helpful in deciding on a PPC budget to set. This is powerful insight that will help you decide on your budget and be competitive.